Detroit deserves a second look. Have you seen the film, Detroit? Few have – and that’s a problem. At a time when the Whitehouse is occupied by a lunatic whose power is largely derived from his impulsive willingness to stoke the fires of racism, one would think director Kathryn Bigelow’s account of the 1967 Detroit conflagration would be welcomed. At a time when all-blue American flags with a mourning stripe mock Black Lives Matter, one would think a film with such great potential to spark meaningful dialogue among whites who have no idea of the very real issue of police violence in predominantly black neighborhoods would be used as a teachable moment. At a time when so many families either don’t know or fail to pass along to their children the history and personal significance of the turbulent period of the late civil rights era, one would think a movie, even with its imperfections, would be widely seen as an entry point to a past largely ignored and forgotten. In all three instances, you’d be wrong to harbor such hopeful thoughts. The film, which I watched last night, (along with only two other movie patrons), has been savaged by movie critics, and therefore, poorly attended at a time when no one else is making major-release films on topics that deal with that soon-to-be-unknown period. The criticism falls into two overlapping camps. One is that the, (two-hour and twenty-three-minute long), movie doesn’t bother to inform the viewer of the active political movement within the black community prior to the riot. The other, predictably, is that both the writer and director are white, which both acknowledge limits the depth of experience brought to the script and the film. My counter to the first criticism is that Detroit is not a PBS documentary in which context and richer character development can be constructed in four to six hours. As to the second criticism, the pretentious charge that Detroit “made by whites for whites” may be, in part, true. 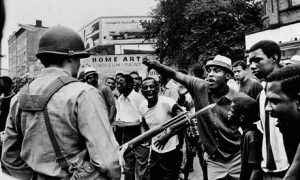 Are critics unaware that a helluva a lot of whites have no idea that un-impugned police misconduct, let alone the myriad causes of urban uprisings, actually occurred during the 1960s? I left the theatre feeling both helpless and hopeless, last night. The film’s gripping content clearly spoke to the contemporary relevance of the themes, something few damning critics bothered to notice. That accounted for my feelings of helplessness. As for hopelessness, I know I’ll return to my students on Tuesday knowing they’ll have no prior knowledge of their grandparent’s experiences, much less Reconstruction, the period I’m now teaching. Of course, it’s my job to introduce them to this history, but without a dialogue at home and in the community in general, I fear, and with good reason, that any fruit borne from studying the past will merely rot. Perhaps just as tragic, my own neighbors will dismiss the message of Black Lives Matter as they hoist their Blue Lives Matter banners, never once considering they’ve been conned by racists whose new ascendancy might be tempered by a film that dared to give treatment to an important set of relevant ideas.